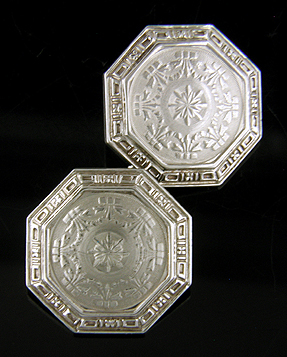 WAB garland style cufflinks, circa 1925. Wordley, Allsop & Bliss (WAB) was one of the more prolific makers of fine cufflinks during the early decades of the last century. Founded in 1907, the firm created beautiful cufflinks in a great variety of styles and designs. Their work ranged from late Victorian sleeve links to dramatic, if understated, Art Deco designs during the 1920s. One of the signature designs of WAB was sweeping garlands surrounding a blossoming flower or sparkling gemstone. Known as the "garland style", these cufflinks reflect the influence of beautiful jewels created by Cartier in Paris and Faberge in St. Petersburg during the years around 1900. Turning away from the sometimes fussy eclecticism of Victorian jewels and the surreal "naturalism" of Art Nouveau design, Cartier and Faberge turned to late 18th century France and the ill-fated court of Louis XVI for inspiration. The elegant jewels of the period sparkled with a cornucopia of Neoclassical motifs - garlands, swags, bowed ribbons and naturalistic flowers. WAB sapphire and gold cufflinks, circa 1925. WAB's interpretation of Neoclassical design incorporates bowed ribbons - represented as three squares or rectangles in a row with flared ends just below - from which suspend flowing garlands of small flowers. The garlands surround a stylized flower, or is it a radiant star burst? The centers were also often set with diamonds or rich blue cabochon sapphires. WAB black and white ufflinks, circa 1925. 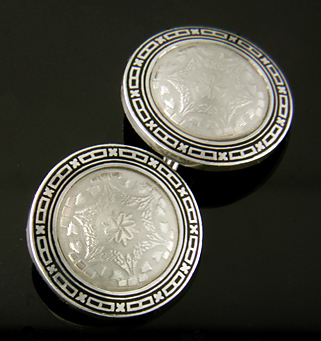 Most of the WAB garland-style cufflinks have double-box-and-cross borders as thrown into dramatic relief in this pair of black-and-white cufflinks from the Art Deco era. A second border design features elongated "S" scrolls in trapezoid-shape cells. This border appears to have been reserved for rectangular cufflinks with canted corners. The gold and cabochon sapphire cufflinks pictured above are a nice example of the latter design. 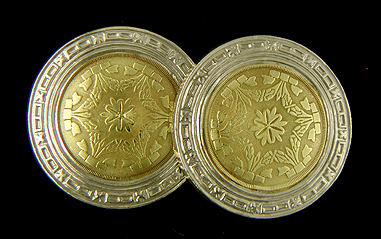 WAB created beautiful cufflinks in white and yellow 14kt gold from 1907 into the 1930s. During this period the firm underwent several name changes and was eventually absorbed by Krementz & Company during the 1950s. The maker's mark of the firm, "WAB" with the letters conjoined, is found stamped on the cross bars of the cufflinks with a "14K" gold purity mark just below or on the opposite side. Strobell & Crane garland style cufflinks, circa 1920. Although WAB was a significant creator of garland style cufflinks, they were not the only one. Other firms like Larter & Sons and Strobell & Crane also embraced the style. The above pair of Strobell & Crane cufflinks features cascading garlands of laurel leaves surrounding stylized flowers and faceted blue sapphires. The sweeping garlands are enclosed in a quatrefoil frame which along with the antique color of the gold gives the cufflinks a wonderful Medieval feel. Recent additions to the Antique Cufflink Gallery include classically elegant Sapphire and Diamond cufflinks, Carrington onyx and platinum octagons, beautifully engraved Sapphire and Diamond cufflinks, and white and yellow gold garland-style cufflinks from the 1920s. Classical Elegance Foliate wreath borders, pinstripe centers, sparkling diamonds and rich blue sapphires. An elegant example of the inescapable beauty and timelessness of antique cufflinks. Crafted in 14kt gold, circa 1920. Onyx and Platinum Striking Carrington cufflinks featuring eight-sided black onyx centers surrounded by brightly polished and engraved platinum borders. Crafted in platinum and 14kt gold, circa 1925. Sapphires and Diamonds Elegant platinum and gold cufflinks set with blue sapphires and sparkling diamonds. The platinum centers are surrounded by dramatic yellow gold borders. Crafted in platinum and 14kt gold, circa 1920. Engraved Elegance II Elegant two-tone cufflinks with intricately engraved yellow gold centers surrounded by dramatic white gold borders with alternating scrolls and flower heads. Crafted in 14kt gold, circa 1920. Recent additions to the Antique and Estate Jewelry Gallery include a striking Art Deco Citrine brooch and stickpins featuring noble horses and fiery dragons. Art Deco Brooch A dramatic Art Deco brooch set with a beautiful honey-colored Citrine. The gold sides of the brooch rise up pyramid-like to support the gemstone. Crafted in 14kt gold, circa 1930. Equestrian Beautifully designed stickpin of an energetic, alert horse. A small red stone (likely a garnet) is set in the eye. Crafted in 14kt gold, circa 1925. Dragon and Sceptre The Victorians celebrated an exotic menagerie of mythical and whimsical creatures atop their stickpins. This pin features a fierce dragon protecting a golden sceptre while warily watching with a dark green eye. Crafted in 14kt gold, circa 1900.